#Puppycam is streaming live on the facebook! Need gift ideas? Stocking Stuffers? 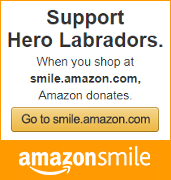 Just want to support Hero Labradors AND show your pride? 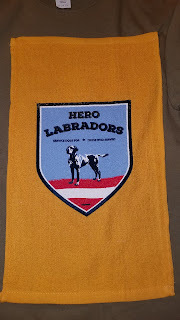 New shirts and towels ARE HERE! 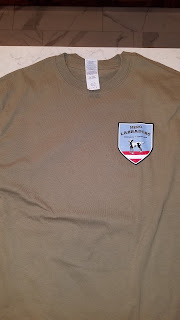 Shirts: "Prairie Dust" (Looks like a brownish olive drab to me) in both 100% cotton or moisture wicking. Supposedly the same color as the undershirt for the multicam/OCP uniform undershirt. 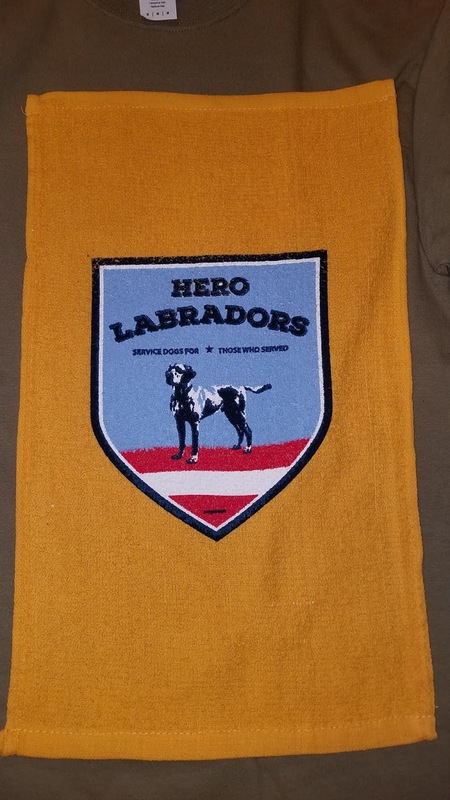 Spirit Towels: Great for waving at Steelers, Green Bay, or other football games, look great on a golf bag or bowling bag, also great for burping babies, wiping a bar, bearing down on while someone removes a bullet in a back alley, you know, stuff we all generally use hand towels for. You: "Hey Chuck! I want 3 XL moisture wicking shirts and a towel!" Me: "Super! That comes to $82. Where do you want them sent?" Me: Awesome. 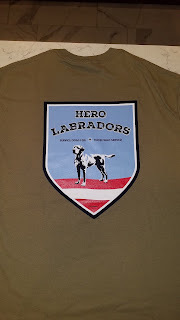 As soon as I see your donation hit at www.paypal.me/herolabradors, I'm stuffing these in a mailer and driving to the post office! Nancy Jane “Janie” Bostic, 80, passed away unexpectedly on Wednesday, November 14, 2018. She was born June 23, 1938 in Wabash, Indiana to the late Jules Haslett and Marie Kaess-Haslett. She was a ten-year Longaberger employee where she started as a basket weaver and then worked as a quality assurance technician. She was a member of both the Zane Gray and Guernsey Valley Antique Car Clubs, and the Ohio Child Conservation League (“Mother’s Club”). She is survived by her loving husband of 54 years, Wil Bostic, her favorite children, Scott (Jenness) Bostic of Washington, DC, Ree Simpson (Troy Gussler) of Westerville, OH, and Amy (Todd) Rinder of Beaverton, OR; her precious grandchildren Scottie and Loudon Bostic, Isabella Geist and Max Simpson, and Kaess and Sydney Rinder; her brother Gene Haslett, nieces and nephews, step brothers/sisters-in law, several loving friends, and her devoted Springer Spaniel, Winston. In addition to her parents, she was preceded in death by her brother, Butch Haslett, and mother and father-in-law Bud and Mabel Forester-Kramer. The family would like to extend special thanks to the Chief and staff of the Buckeye Lake and Hebron Fire Departments, and the doctors and nurses of the Licking Memorial Hospital Emergency Room. Janie didn’t know a stranger and would always greet friends, old and new, with a hug. Her infectious smile, laughter, and ornery sense of humor was cherished by everyone with whom she came in contact. She was the most unassuming, non-judgemental, accepting-of-everyone person on the planet and would immediately make acquaintances feel like family. She was generous and kind, sweet and hilarious. She liked to tell stories and make people laugh. She would never show up empty handed, and would even show up to her dentist appointments with cakes, cookies, and sweets, for the office staff. A Celebration of Life service will be held at 12:00 noon on Friday, December 28, 2018 at THE SNOUFFER FUNERAL HOME, 1150 WEST MILITARY ROAD, ZANESVILLE, OHIO, with Chief Clifford Mason officiating. Friends may call one hour before service. 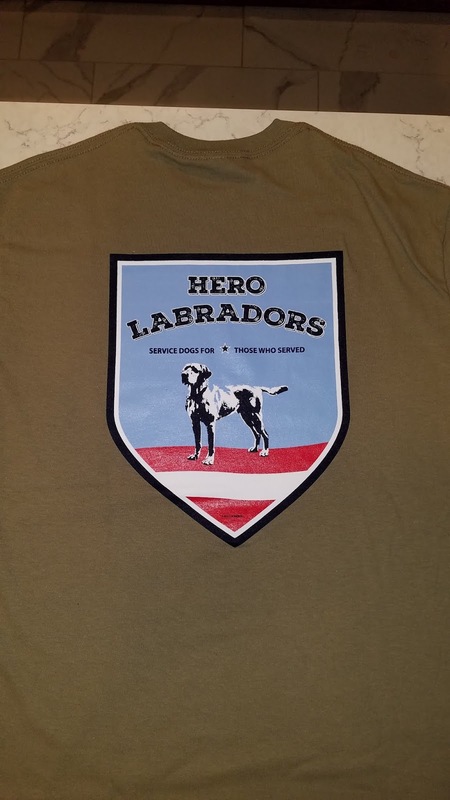 Hero Labradors is a 501(c)3 nonprofit organization that breeds and selects Labrador Retrievers with the aptitude for service dog training, and provides them free to training programs who agree to train them and donate them to veterans, first responders, and their families.